The Great Music Book Series is devoted to great music books that have gone out of print and have been hard to find in the ensuing years. We've vowed not to allow these great books to fall into obscurity and have faithfully and lovingly republished them in impressive paperbound editions and ebooks. In upcoming years we plan to research and republish worthy books that will be superb additions to the libraries of every music lover and music book reader. 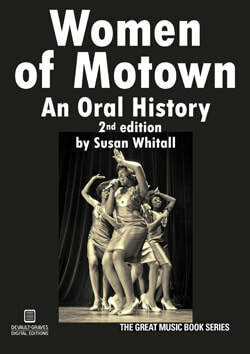 Women of Motown: An Oral History by the fantastic Susan Whitall is the latest addition to our Great Music Books Series. In this book the women get to tell their side of the Motown story and the stories they tell are fascinating, engrossing, illuminating, and many times downright hilarious. ​The book takes us from the earliest female Motown singer Mable John (later part of the Stax stable) through the fabulous girl groups such as the Marvelettes through the different permutations of the Supremes and ending with latter day singers such as the great Kim Weston. Whitall, formerly of Creem magazine and The Detroit News, adds narrative and perspective and makes this a must-have book for any fan of Motown or the glory years of the soul music revolution. 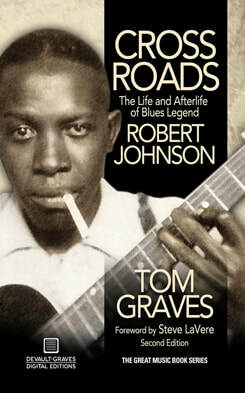 This second edition of the award-winning Crossroads by Tom Graves is the author-approved new manuscript that contains updated information and new photographs related to blues legend Robert Johnson. Crossroads won the Keeping the Blues Alive Award in Literature in 2010 from the prestigious Blues Foundation and is considered the definitive word on its enigmatic subject. The result of careful and meticulous research, this stylishly-written biography of infamous blues musician Robert Johnson reveals the real story behind the mythical talent that made him a musical legend. According to some, Johnson learned guitar by trading his soul away to the Devil at a crossroads in rural Mississippi. When he died at age 27 of a mysterious poisoning, many superstitious fans came to believe that the Devil had returned to take his due. This diligent study of Johnson's life debunks these myths while emphasizing the effect that Johnson, said to be the greatest blues musician who ever lived, has had on modern musicians such as Eric Clapton and the Rolling Stones. The tiny Sun studio at 706 Union Avenue in Memphis, Tennessee, may not have looked like much from the outside, but inside musical miracles were being performed daily by its enigmatic owner, Sam Phillips. A white man who loved and understood African-American music, Phillips recorded soon-to-be-blues icons such as Howlin' Wolf, Rufus Thomas and B.B. King. A seismic shift occurred during one session in 1951 when Phillips recorded "Rocket 88" with Jackie Brenston and Ike Turner. That shift was to become known as rock and roll. A shy white boy named Elvis Presley came into the studio to record a song for his mother's birthday. Phillips recognized something in the young man, and a moment of silliness in the studio ruptured into the first record of the future King of Rock & Roll, "That's All Right." Hot on his heels came Jerry Lee Lewis, Carl Perkins and Johnny Cash. 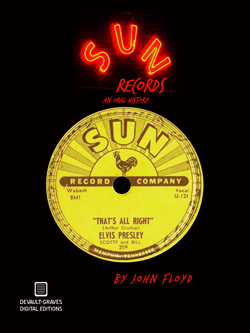 Sun Records: An Oral History (2nd edition) brings to readers the voices of the pillars of Sun Records, the artists, producers and engineers who made the place tick. Thomas (the first hit-maker for Sun), Scotty Moore, Rosco Gordon, Little Milton Campbell, Billy Lee Riley, producer and musician Roland Janes, producer Cowboy Jack Clement and others all tell their inimitable stories about the making of a music empire, the label that put rock and roll on the world map. Did Elvis's identical twin, Jesse Garon Presley, really die at birth? Not according to Lance Lee, the hero of Gerald Duff's darkly comic dissection of fame and rock 'n' roll. 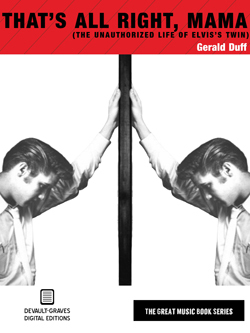 Lee, who makes his living as an Elvis imitator, claims to be the long-presumed dead twin. In a style that faithfully reproduces Elvis's plaintive bravado, Lance-Jesse recounts being hidden away and passed off as Elvis's "cousin" until he needs to impersonate Elvis to stave off bullies at school; later, he is obliged to "play Elvis" every time The King has an attack of nerves. As performing substitute, Jesse has had a lifetime to enjoy being a good-timing, honey-loving, non-drug-dependent Elvis.